On your way to Banda Abou, chances are you must stop to let a family of goat cross the street. They are everywhere on the island, so it is no surprise that it is also a popular local food. This hearty dish, with tender meat, is full of flavor thanks to all the herbs in it. They slow cook the goat meat with all its herbs for many hours to tenderize the meat and to let the flavors soak in. This meat is so popular in our cuisine that new creative dishes made of this meat started emerging. At Williwood, a popular stop for many during a road trip at Banda Abou, they serve delicious ‘Kabritu Burgers’. The Kabritu Burger is a totally new concept, where you can get a taste of a burger bursting with local flavors. Though most of our typical foods are hearty dishes, we do have a thing for sweets as well. We have a variety of typical local cakes, but a good Cashew Cake will always win the race. Locals believe that the best Cashew Cakes can only be made by a home baker. That is why when people are looking to buy one, they ask friends instead of driving to a store. Cake Faces, a home bakery, sells Cashew Cakes infused with Senior Genuine Curaçao Liqueur. You can easily order your cake on their Facebook page and devour it while you dip your toes in the sea. Being surrounded by beautiful blue water gives us the opportunity to catch the most delicious fresh fish. The most popular one on the island is the Red Snapper. The fish is traditionally paired with polenta, fried plantain, salad and to top it off a traditional sauce is poured over the fish. At Plaza Bieu in Punda they serve many tasty local dishes in their traditional style and one of the best Red Snapper dishes. That is why you will find many locals and tourists enjoying their lunch there. Arepa di Pampuna is a sweet pumpkin pancake that is mostly eaten in between meals or as dessert. Though pumpkin is mostly used during the fall season for other countries, we eat this dish all year around. The recipe is easy but it takes some time to make. That is why it is considered a treat that you must savor. Try the Arepa di Pampuna at Plaza Bieu after having the Piska ku Funchi or just order it to go. Food trucks are all the rage lately, but on the island, we have our own food truck scene. Most food trucks open after 9 pm and stay open till deep in the night. Grabbing a late night bite at a Truk’i Pan is the perfect way to refuel after a night of intense dancing. Choose between fries with grilled chicken breast meat or fish or swap the fries and choose a sandwich. Oh, and remember to add tons of sauce to your food. A few food trucks that were chosen as the best during a recent award are Koki riba Bloki, BBQ Express and Tok Tok on Wheels. Patties are served in many different countries, in different ways and at different moments. 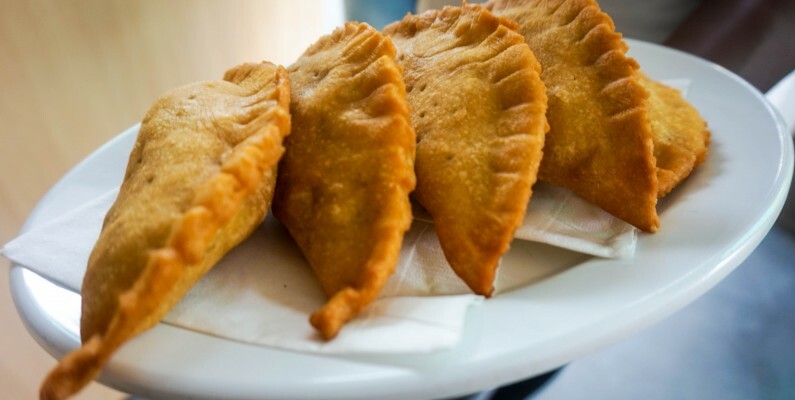 Our Pastechis are a deep-fried dough with various filling like cheese, beef, chicken or codfish. We mostly eat them during morning hours. At Landhuis Chobolobo we serve different Pastechis. Get a taste of one after your morning tour while sipping on a delicious coffee.